Itel S41 FRP google account reset and FRP bypass in 10 seconds. The increase of android production brings about improve in security. By bringing the technology to you and give you innovations. Android FRP is just like iPhone icloud. What is FRP? Factoty Reset Protection. This technology help you retain and restore your android device by login the details so what happens when you can't remember your Google account details. Zamdtek is always there to help you reset your google account so that you can create a new google account for your android. Note : This is for personal use, zamdtek is not responsible for using this tutorial in any other way. We only help you to repair or fix your brick android, Not for you to abuse the repair process that took us time to get right. You have Itel S41 that shows insert google account used to sync the phone. This device was reset so you need google account used on the phone before. Some lateset android of 7.0 and 8.10 version will shows Supprt API 3 or download failed in case of Infinix Smart X5010. 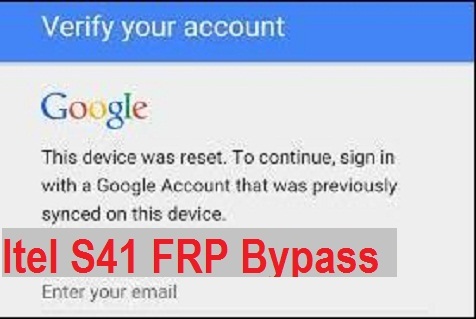 How to reset google account or bypass FRP on Itel S41 FRP using FRP File. Download Itel S41 FRP File here. Check the instructions on how to use SP Tool and FRP file.. Choose the MTK Chip (eg MT6580). You can help us grow and donate to us.